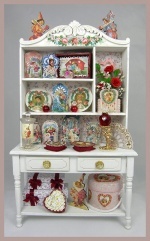 I teach online classes in miniature roomboxes, dollmaking, filled furniture pieces, room boxes, 1/4 scale houses, millinery and various other areas of miniature artistry. I have received many requests for more information on how these classes work, so hopefully, this page will give you all the information and encouragement you need to join in the fun. You can now register and pay your fees thru my shopping cart. Simply purchase the class or classes of your choice, and make your payment via credit card or paypal, or you can mail a personal check. All of my classes are limited in size, and sell out quickly. For this reason, if you are registering and choose to send a check as your method of payment, your spot will be held for you for 10 days to allow receipt of your payment. If your check is not received as promised, you will forfeit your place and it will be given to another student. Prior to class time, you will receive in the mail a kit containing the project contents as described in the course listing. My kits are very complete, and most require minimal tools. For more extensive projects, such as room boxes, you will receive a supply and tool list well in advance by email. Your online tutorial is a very complete, step by step document, with photos and written instructions for each and every step of your project, no matter how complex. Roombox tutorials feature literally hundreds of photos. The tutorials can be viewed online, saved to your computer to view offline, or printed out using a printer friendly PDF file that is included for your convenience. "Am I all on my own???" No, not at all. As you work thru the project, if you find you have questions or need additional assistance, there is a link at the bottom of each page to email me for help. I will respond quickly to your questions and follow up via phone if necessary to assist you with your project. What happened to the chat sessions?? To be perfectly blunt, I got tired of sitting alone in the chat room!!! For the last several projects that I have offered, I had no attendance in the chat sessions. My students tell me that they are able to complete the projects easily using the tutorial, which always provides more than adequate instruction and photos. After setting aside many many Saturdays only to have no one show up for the chats, I decided that they really were not necessary. Instead, you are encouraged to email me at any time with any questions you might have about the project. Thanks!! !